Amazon billionaire Jeff Bezos' Blue Origin space venture sent eight NASA-funded scientific payloads to the edge of space and back on its New Shepard suborbital spaceship, marking another step toward putting people on board. The rocket lifted off into clear, chilly skies from Blue Origin's launch site in West Texas at 9:08 a.m. CT (7:08 a.m. PT). Minutes after launch, New Shepard's gumdrop-shaped capsule separated from the hydrogen-fueled booster and headed to a maximum unofficial altitude of 350,775 feet (66 miles or 107 kilometers). That's well above the 100-kilometer Karman Line that currently serves as the internationally accepted boundary of space. "Welcome home, New Shepard. Wow!" said launch commentator Ariane Cornell, Blue Origin's head of astronaut strategy and sales. The flight lasted 10 minutes and 15 seconds in all. 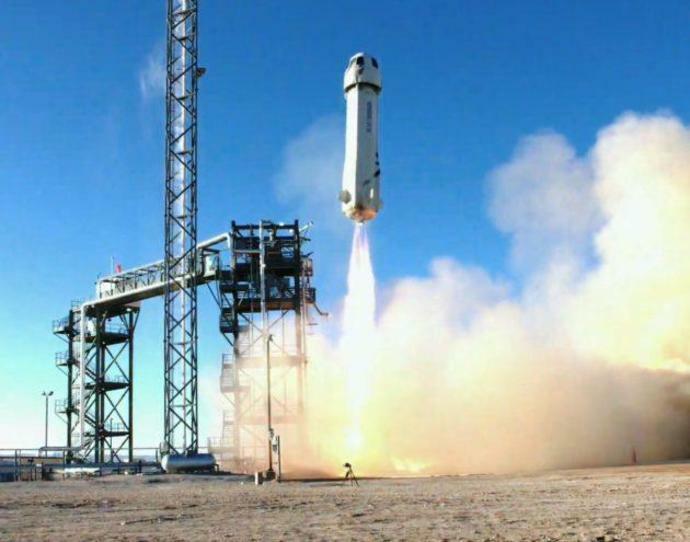 It was the 10th test flight for the New Shepard program, and the fourth go-round for the same booster-and-capsule pair. Blue Origin initially planned for launch on Dec. 18, but it took more than a month to work through a ground infrastructure issue and other technical snags - and wait for acceptable weather. The scientific payloads packed aboard the capsule were flown under the auspices of NASA's Flight Opportunities Program, and included experiments aimed at characterizing the vibrations of flight and the spacecraft environment during the few minutes of weightlessness at the top of the ride. "These NASA-supported experiments will help advance in-space propulsion technologies, habitation systems, science instruments and other capabilities crucial for exploration," NASA Administrator Jim Bridenstine said in a recorded video. "Like the researchers, I'm excited to learn the results from this very important flight." New Shepard is designed to fly itself autonomously, and there were no people aboard the craft for today's test flight. But Cornell said passengers could soon step aboard the next New Shepard spaceship, which has already been built. "We're aiming for the end of this year, but as we've said before, we are not in a rush," Cornell said during today's webcast. "We want to take our time. We want to do this right." The company hasn't yet announced the ticket price, and it's not yet taking reservations.